In my day I have made quite a few quilts and I have taken many quilting courses over the years. But now I only seem to make baby quilts, small projects which can be finished in a relatively short time. Sometimes I make them for a specific baby and sometimes I just make them for fun. At my age you don’t get to attend many baby showers since most of my friends’ children have completed their families, mostly being in their forties. On the other hand women are having children later in life as they first establish careers after long years in university. My own daughter did not have a child until she was 36 and many of her friends were late entries into motherhood. So occasionally I make a quilt for one of her friends and recently one of her single friends adopted a little girl from Guatemala so another opportunity arose to make a quilt. However yesterday I was invited to an afternoon tea given by a friend for her daughter, a lawyer, who is married to an Italian, lives in Italy and is expecting her first child. It was a big event, probably 50 or more women and while many knew her daughter there were some who did not, which included me. My friend asked that one should only bring as a gift a piece of advice written on a card for the new mother. Of course many people ignored that, not the advice bit but the no gift bit, including me. 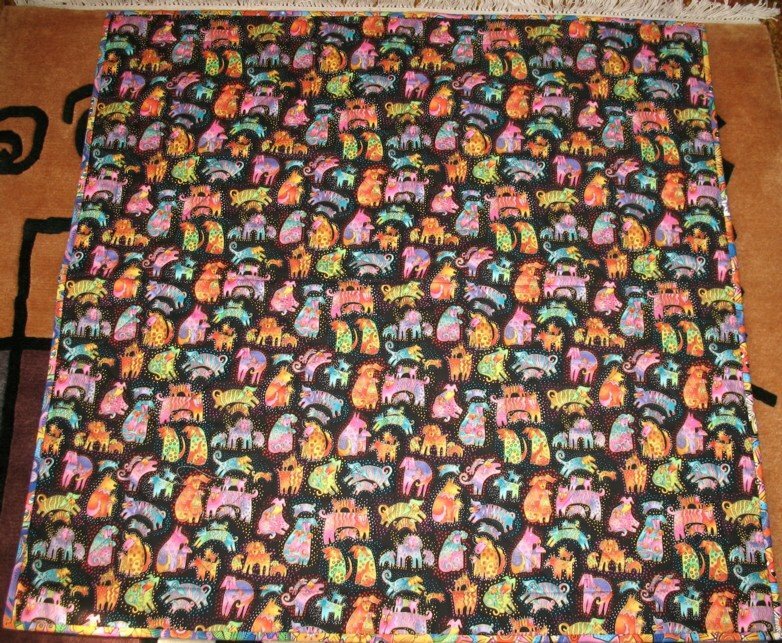 On hand, I had only one finished quilt, one with which I was not totally satisfied as a baby quilt. 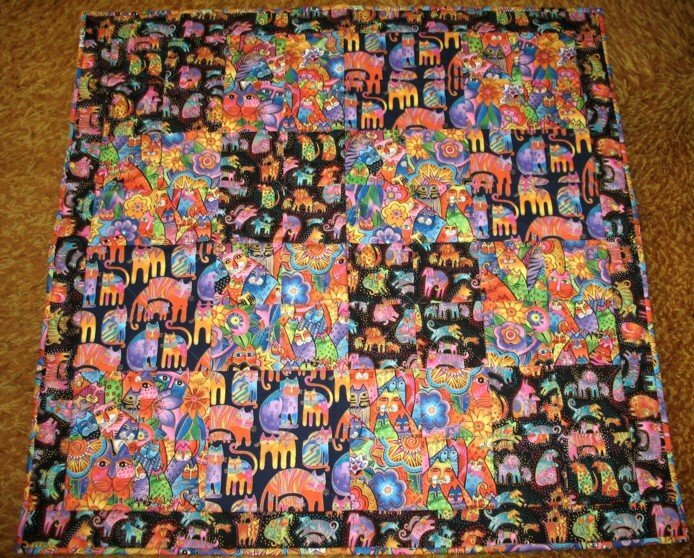 I loved the fabrics, the discontinued felines and dogs series by Laurel Burch, but did not have very much of them, so I could only make a small quilt. It has been finished for ages but I could never quite give it to anyone as I wondered about it as a baby quilt, but I decided it was now or never. What do you think? Too edgy for a baby? Click to enlarge and see the amazing detail in the fabric. OK I am kind of half in love… With Ryan Miller, a sometimes annoying (just like a guy) character in a novel. 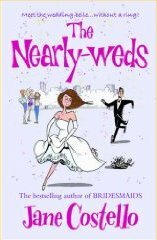 This is a review of The Nearly-Weds by Jane Costello. Yes, sorry guys, more Chick-Lit. Zoe Moore is a kind, warm, down to earth, English girl from Liverpool. She works in a nursery. She is utterly devastated when she is stood up at the church, by Jason (grrr) her long time partner who gets a serious case of cold feet. Suddenly back at home with her parents Zoe finds it difficult to face her friends, neighbours and constant reminders. Poor Zoe actually gets to nanny in Boston for Ryan Miller and his two children, Ruby and Sam. Zoe feeling fragile looking after a family very hurt in their different ways by the death of Ryan’s wife. Very quickly she begins to wonder what she has gotten herself into and if she has bitten off soo much more than she can chew. She is met at the airport by Ryan and the children, taken to their home and just left with the kids as he goes off to work. The house is a trash heap and the yard is an overgrown jungle. When Zoe tries to put the kids to bed they practically morph into monsters. And she can’t seem to get the wretched Jason out of her head. She quickly realises Ryan is rude, inconsiderate, irascible, brittle, defensive, difficult, work obsessed, drinks more than he ought, and has been through a string of short relationships with beautiful women. Oh and he is hurt, handsome and in excellent physical shape. Zoe sets about winning the kids round and restoring the house to some sort of order and it is a tall order too. Thank goodness for the a group of nannies in the area where she will find companionship and a new best friend. I shall say no more about the story. I really enjoyed this novel. It has plenty of fun and romance. It made me smile and even laugh a couple of times. It made me feel good. There is a wide cast of good characters and Zoe and Ryan are a real contrast, Austin fans might sense a half familiarity in them as they spar. If you read and enjoy it half so much as I did then I figure it will time well spent. 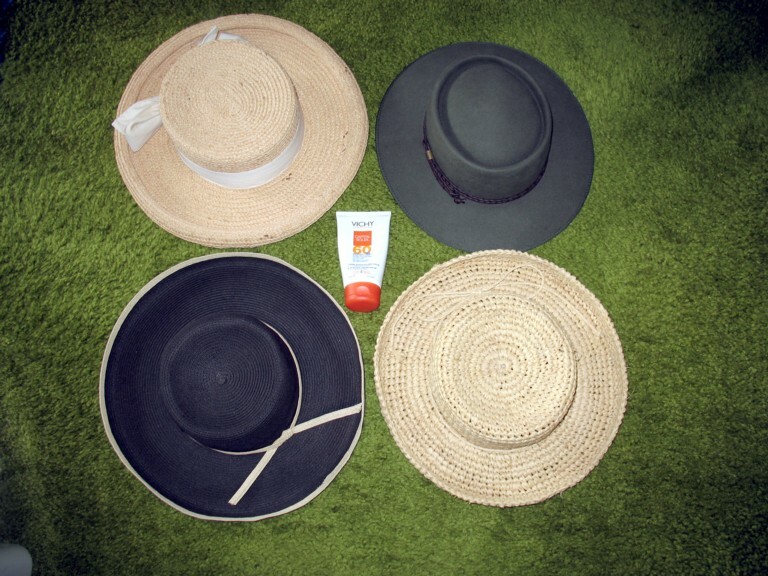 Slip-Slop-Slap is the name of a health campaign in Australia exhorting people to “slip on a shirt, slop on sunscreen, and slap on a hat” when they go out into the sun, in order to protect themselves against an increased risk of skin cancer. My husband has had three operations for skin cancer, including a malignant melanoma and a squamous cell skin cancer and he has had many basal cell cancers removed as well, no doubt due to his surfer dude youth in Australia. So we both cover up when out in the sun. 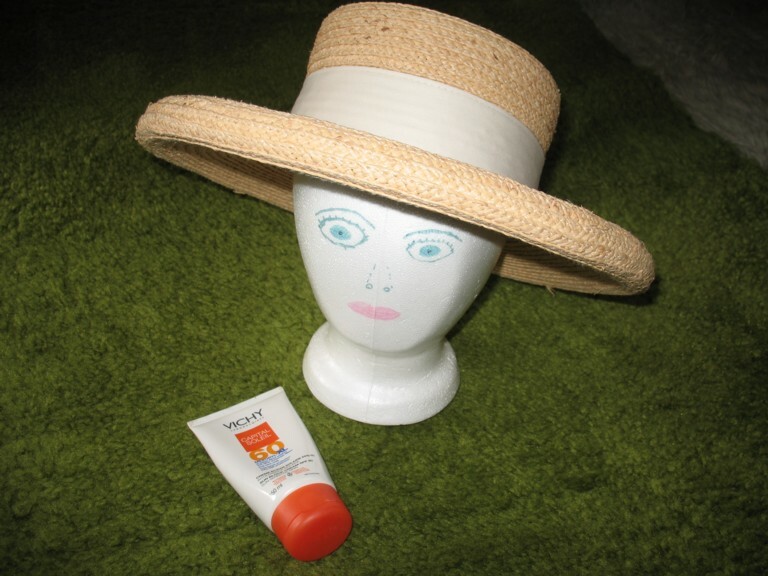 Yes, I always wear a hat outdoors and I also wear a sunscreen with SPF 60 rating which means I am pretty pale summer and winter. Now you did not just think I had the one hat, did you? I have a quite the collection and in fact I have over twenty hats and some have featured on this blog before. This post is in a way an introduction to book I read this week for The Short Book Club and it fits in quite nicely with the fact that I was recently in Sydney, my home town. There I attended a lecture called Convict Sydney and most of the information is culled from my notes, with a little checking as well. Incidentally the book is The Secret River by Kate Grenville and a book review post will follow soon. Everyone likes to tease Australians about their “convict background” since Sydney was of course founded as a penal colony and they assume that we are all descended from those who were transported to Australia as criminals and that Australia was the only place where convicts were sent. However transportation as a punishment was by no means a new thing for the British in 1788, since they had been transporting convicts to America since 1717 but that came to a halt in 1776 with the American Revolution. In all around 50,000 were transported to America. When the prisons in Britain became full convicted felons were housed in overcrowded decaying old ships moored in coastal waters but conditions were appalling and transportation recommenced as the First Fleet sailed for Australia, eleven ships with (numbers vary depending on source) 573 male and 193 female convicts along with 247 marines, and with the ships’ crews and some family members, making the first settlers around 1400 in number. So who were these felons and what were the crimes they had committed? Many people had fled from the country to the cities where there was no work and crime was rife. But crimes warranting the death penalty (which could be commuted to transportation) included poaching, cutting down a tree, stealing goods worth 40 shillings or more. In fact there were hundreds of crimes for which the penalty was death, including a very strange one, namely being in the company of Gypsies for one month. Later the system of laws and punishments of the time became know as the Bloody Code, since so many crimes were punishable by execution. Before setting sail many of the prisoners had already been on the ships for 7 to 8 months. They slept four to a berth, with the women segregated. At first they were chained but later they were freed and considering the voyage lasted for eight months and the crowded conditions it is amazing that only about four dozen people died and despite travelling 15,000 miles, not one ship was lost on the journey. “the finest harbour in the world, in which a thousand sail of the line may ride in the most perfect security …”. The fleet landed there on January 26th 1788 and Phillip named it Sydney Cove in honour of Lord Sydney, the Home Secretary. But all did not go well in those first years as the soil was poor and sandy and, since there were few farmers there was a shortage of food which lead to rationing. The indiginenous people, the aborigines, were hostile and there was much conflict between the settlers and the aborigines. Despite the abundance of fish the settlers were not good fishermen and by the time the infamous Second Fleet straggled into port in 1790, in dribs and drabs, things were not going well. The Second Fleet had been “contracted out” to private businessman who kept the convicts in dreadful conditions, chained, beaten and starved so the survivors were hardly a help to the struggling colony. But progress was being made despite these difficulties and the continuing conflict between settlers and aborigines who naturally resented being dispossed of their lands. In fact Governer Phillip himself was speared in the leg on Manly Beach. Phillip was a good governor on the whole, humane and sensible and he tried to utilize the convicts according to the skills they had acquired in Britain: brick makers, carpenters, shepherds, etc. Educated convicts were set to work as record keepers and the colony slowly began to be established. But the formation and arrival in Australia of the New South Wales Corps, more colourfully described as the Rum Corps, for controlling the rum trade was ultimately their chosen profession in the new land, meant that the gaolers were not much better than the convicts, since the members tended to be troublemakers and parolees from military prisons who were looking for a new start in the fledgling colony. When Phillip returned to England in 1790 due to ill health, their commander Major Francis Grose took over and his rule was in no way as benevolent as had been Phillip’s. 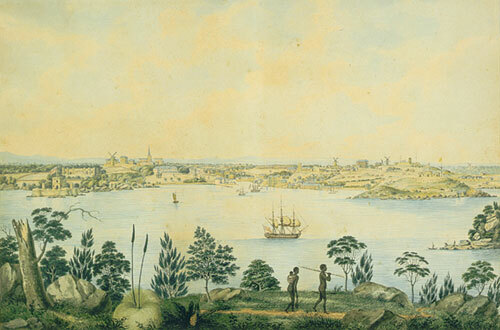 However the young colony slowly flourished, especially under Governor Macquarie (1821-1827), known as the great builder and by the time that the transportation of convicts to Australia came to a halt in the eighteen fifties, a mere eighty years later, the continent of Australia had been colonized in many other parts and the population stood at 1 million. In all the total number of transported convicts was around 162,000 men and women and they were transported to Australia on 806 ships. According to the lecturer, the fact that it began as a penal colony has given Australia or Australians the following series of characteristics which he called its convict legacy. The Secret River tells the story of one man’s experience as he was transported to the Great Southern Gaol, not long after it was established and I’ll tell you more about next time.